So should investors rebalance their portfolios or just let them alone? (Bloomberg Gadfly) --It’s a new year, and for many investors that means it's time to rebalance that old portfolio. Portfolio rebalancing is one of the most cherished wisdoms in investing. The markets can whipsaw investments in a portfolio over time, and rebalancing brings it back into, well, balance. Rebalancing is also a backdoor way to buy low and sell high because it forces investors to sell some of their winners and buy more of the losers. Not everyone agrees, however, that rebalancing is a no-brainer. As the Wall Street Journal pointed out recently, some experts think that neglecting a portfolio can yield better results. To find out, I looked at how a traditional 60/40 portfolio of U.S. stocks and bonds fared under each scenario. I used annual returns for the S&P 500 and five-year Treasuries since 1926, the earliest year for which data are available. The “rebalanced portfolio” is rebalanced back to 60/40 at the end of each year. The “neglected portfolio” starts at 60/40 and never rebalanced. It turns out that investors can on paper make more money doing nothing. The neglected portfolio returned 9.4 percent annually from 1926 to 2016 (those are total returns), while the rebalanced portfolio returned 8.6 percent annually. Granted, most investors don't keep portfolios for 91 years, but the results are nearly identical over shorter periods. The neglected portfolio returned an average of 9.7 percent annually over rolling 10-year periods, while the rebalanced portfolio returned and average of 8.8 percent annually. The additional return of 0.8 percent annually generated by the neglected portfolio may seem trivial, but it adds up over time. A $10,000 investment in the neglected portfolio would be worth $29,000 more than the rebalanced portfolio after 30 years, and a princely $17.3 million more over the entire 91-year period. The reason is simple: Stocks grow at a higher rate than bonds over the long run. The S&P 500 has returned 10 percent annually since 1926, whereas five-year Treasuries have returned only 5.1 percent annually. If the portfolio is never rebalanced, then stocks increasingly dominate the portfolio over time. That 60 percent allocation to stocks in 1926 turns into a 99 percent allocation in 2016. And with more stocks comes more risk. 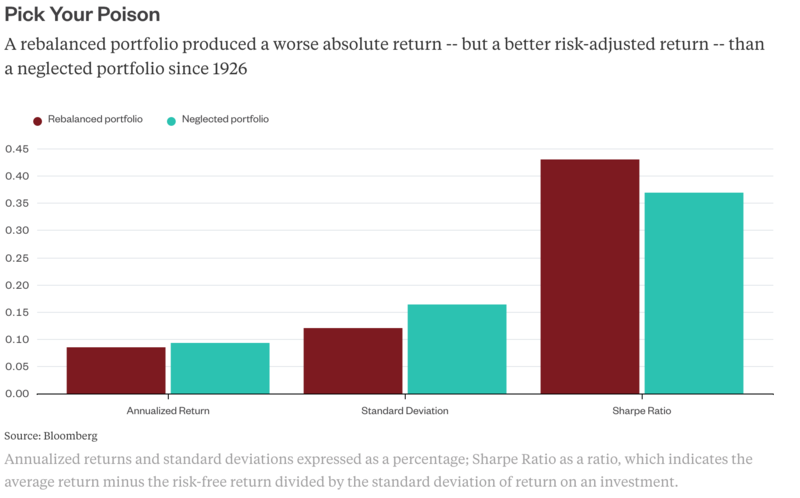 In theory -- and as the higher return for the neglected portfolio implies -- more risk should also come with more return. But it’s far from certain that investors are able to tolerate that additional risk and hang on long enough to collect their reward. Consider, for example, how stock investors have fared compared with bond investors over the last 15 years, the longest period for which data are available. According to Morningstar, the Vanguard 500 Index Fund -- which tracks the S&P 500 -- returned 6.6 percent annually from 2002 to 2016. But to get that return, investors had to be invested in the fund the whole time -- a difficult proposition for many investors on the roller coaster ride that accompanies stock investing. The result is that the average investor’s actual return from the fund was 4.5 percent annually over those 15 years. Because of poor timing decisions, in other words, the average investor managed to capture just 68 percent of the fund’s return. 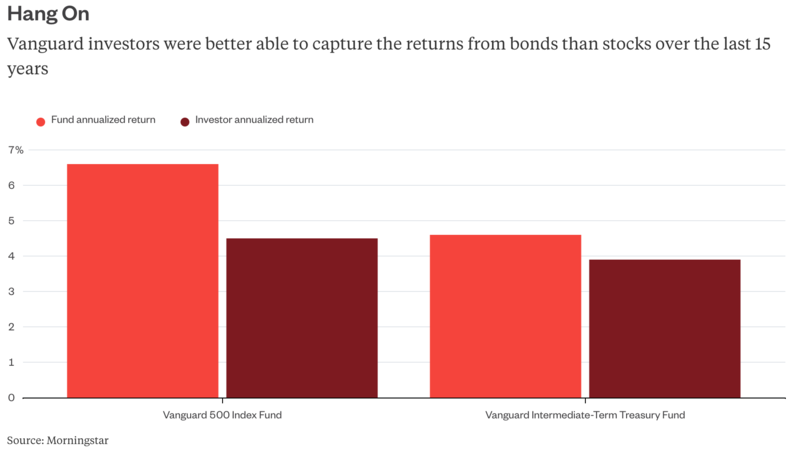 Bond investors, on the other hand, fared far better. The Vanguard Intermediate-Term Treasury Fund has returned 4.6 percent annually over the last 15 years, whereas the average investor’s return was 3.9 percent annually. In this case, the average investor managed to capture 85 percent of the fund’s return. The lesson is obvious: The more risk investors take, the less likely they are to actually achieve the desired return. As Woody Allen might say, sometimes to have a little less risk is the most brilliant plan. Which brings us back to rebalancing. Sure, a neglected portfolio might look good on paper, but I suspect that investors would be better off giving their portfolios a little TLC every now and then. Nir Kaissar is a Bloomberg Gadfly columnist covering the markets. He is the founder of Unison Advisors, an asset management firm. He has worked as a lawyer at Sullivan & Cromwell and a consultant at Ernst & Young.